Mobile learning remains one of the fastest moving eLearning trends today. Embracing mobile learning can significantly extend the longevity of your corporate training. In this article, PulseLearning outline questions to help you decide if mobile learning is right for your organization. The evolution of how we live, work and access information now calls for a new corporate training experience. Embracing mobile learning can significantly extend the longevity of your corporate training and increase the ROI on your educational spend. Here at PulseLearning, we answer the top 6 questions to help you decide if mobile learning is right for your organization. 1. Are Your Employees Time Poor And Find It Difficult To Slot In Training? If your workplace is a fast-paced environment, employees may only have short windows of time to fit in training. A microlearning approach to mobile learning could make all the difference to ensuring training compliance requirements are met. 2. Do You Want Your Content To Be Accessed On A Mobile Device? If your employees are on the move more than deskbound, providing training on mobile devices can provide flexibility and convenience for completing training when and where employees choose. 3. Do You Want To Create An Ongoing Training Resource Rather Than A One-Off Learning Experience? A mobile learning solution can provide an on-demand resource that employees can access in the moment while performing work tasks. Mobile learning removes the need to memorize information since it can be always accessed. 4. Do You Need Learning To Be Immediately Applied On The Job? Mobile learning allows for immediate application of knowledge on the job rather than being delayed until after completing eLearning or classroom training. 5. Is Your Content Suitable For Delivery On A Small Screen? Your development team is responsible for a certain amount of this, but keep in mind that some training content doesn’t work well in a small format. 6. Is Your Training Content Subject To Frequent Changes And Updates? If so, a microlearning approach to mobile learning can allow you to easily edit individual modules without taking the training completely offline. Learning assets can also be repackaged to create new courses. Your answers to these questions will help you determine if mobile learning is right for your organization. 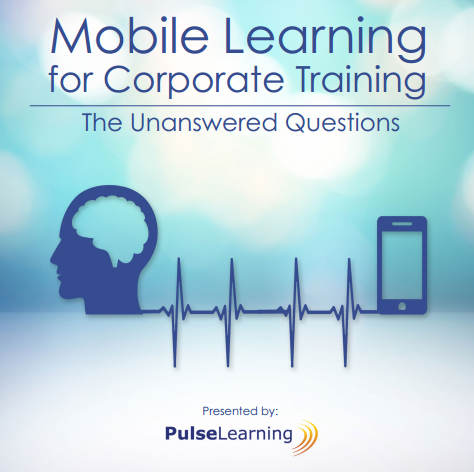 If you are considering mobile learning for corporate training, check out our free mobile learning eBook, an informative resource to get you moving. PulseLearning is an award-winning global learning provider who understands the need of accommodating mobile users. PulseLearning can assist you in developing a mobile learning strategy that will provide your learners with flexibility and greater convenience. Follow the conversation at #mobilification.